This Facom sliding T bar has a 1/2 inch drive to fit 1/2 inch sockets or extensions. 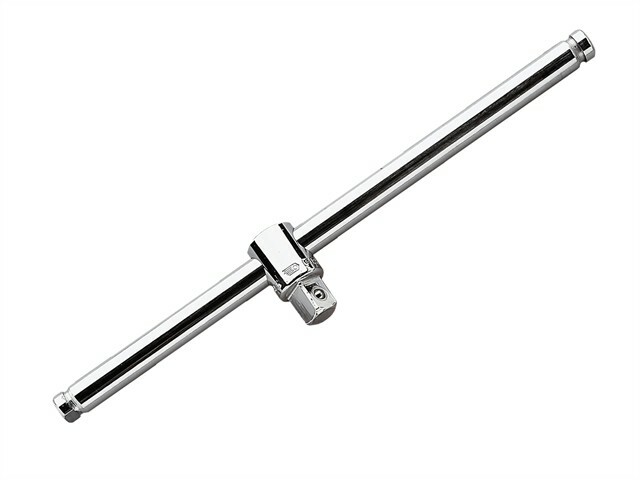 The T bar slides and has a friction head which allows the bar to be used as a T or L handle. Grooves at either end of the bar prevent it from sliding out the drive. The long bar enables more leverage, and easy two-handed use, thus making tightening and loosening fastenings easier. The FCMS120A Sliding T Handle is 275mm long. Performance: Conforms to ISO 3315, DIN 3122, NF ISO 3315.